While the ginger rhizome is most sought after and known for its medicinal properties, it is often overlooked as an excellent source of some vitamins and other active compounds. The truth is, ginger nutrition has great value, and as one of the most popular herbal condiments used around the world, it is very simple to add to your diet. There are many essential nutrients that are found in high quantities in ginger. The main ginger vitamins are vitamin C (ascorbic acid) and B9 (folate), but it also contains minerals, such as potassium and magnesium. Vitamin C is an important antioxidant found in ginger that aids in the development and health of many of the body's tissues, including the skin and bones. Vitamin C helps to protect the body and strengthen the immune system, as it can prevent and delay the formation of free radicals in the body. Vitamin C deficiency can lead to many health issues, including scurvy, so it is important to ensure regular vitamin C intake. Another nutrient in ginger is B9, also known as folate, which is critical in the metabolism of nucleic acid precursors and several amino acids. 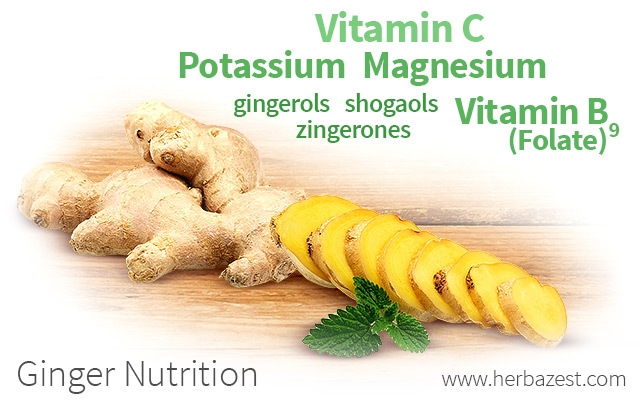 This ginger vitamin is important in brain development and function. Excessively low levels of folate can result in megaloblastic anemia and possibly irreversible brain damage. Folate levels are often influenced by genetics, but can be supplemented by the food you consume. Furthermore, ginger's high magnesium levels make this herb important for healthy nerve and muscle function, while its high levels of potassium make it good for ensuring normal digestive function and muscle contraction. There are at least 115 bioactive components identified in ginger. However, it is believed and supported by current research that the active constituents that contribute to ginger properties are pungent phenol compounds, namely gingerols, shogaols, and zingerones, all of which are closely-related terpenoids. Raw ginger contains high concentrations of gingerols, while dried ginger exhibits slightly reduced levels of gingerols but abundant shogaols. When ginger is cooked, the gingerol levels are greatly decreased, as many are converted to zingerones. All three constituents have demonstrated anti-inflammatory, anti-emetic, and anti-spasmodic properties; however, shogaols tend to be more potent than zingerones. Research has demonstrated that ginger and its constituents tend to accumulate in the gastrointestinal tract, further supporting the claims of ginger as an antiemetic and anti-nausea agent. The nutritional value of ginger is higher when this herb is consumed in its raw form. This is due to the fact that many of the nutrients in ginger, such as vitamin C, break down during the food preparation process as a result of heat exposure, as well as when the ginger root has been exposed to prolonged light or storage. Ginger's phenolic compounds, such as gingerol, have powerful antioxidant properties and may prevent cellular degradation. These compounds may play an important role in preventing diseases and slowing their progression. Preliminary ginger research and studies have shown gingerol to support the health of gastrointestinal tract, colon, breasts, and skin. Despite all that we know about ginger health benefits for the human body, there is still much for science to reveal. However, what we do know shows that ginger's nutrients are very useful. For that reason, you should consider incorporating ginger into your diet.